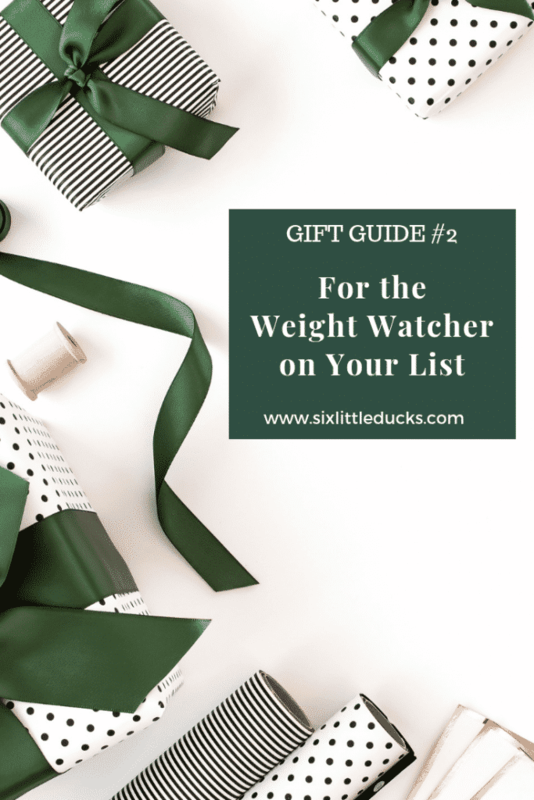 I am a lifelong Weight Watcher and am always looking for things that make this journey easier. 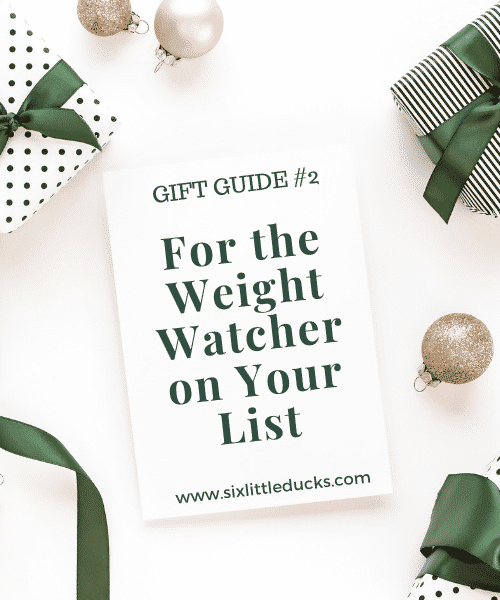 Everything in this gift guide is designed to help a Weight Watcher on their weight loss journey and make it fun along the way! Losing weight isn't always easy, having fun toys and gadgets to play with in the kitchen makes it much more enjoyable! 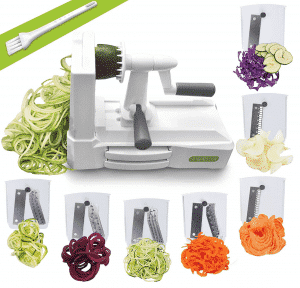 With Zoodles being such a popular ingredient, especially to lower carb eaters, this Spiralizer is an absolute necessity. You're not limited to just zoodles either, you can use this to spiralize sweet potatoes, butternut squash, cucumbers, carrots, the list goes on and on. You can use any of these ‘noodles' to replace regular pasta in ingredients to make them lower carb and higher fiber. One of my favorite spiralized recipes is Kung Pao Tofu Zoodles. 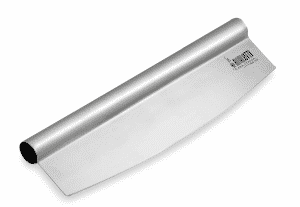 When a recipe calls for chopped onions, this chopper makes the job much faster and cleaner. 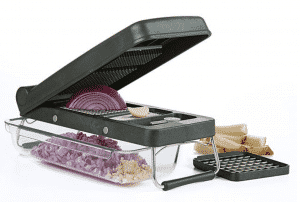 You can shop a whole onion in seconds and ‘catch' the chopped onions in the container below. In addition, you chop the onion so fast there's no time to cry from them! This chopper is great for other vegetables like bell peppers, carrots, radishes, garlic, and pretty much any vegetable that you might chop. Any time you're trying to be healthier, the first thing you usually hear is “drink more water”. While that is very good advice, sometimes plain water can be boring. 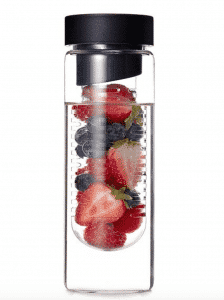 This bottle allows you to add the essence of any fruit you'd like to use. This is a great substitute for soda and helps you get more water in during the day! 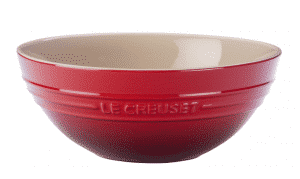 Le Creuset has some of the best bowls and stoneware available. We use the Le Creuset multi-use bowl for everything. It's great to use as a mixing bowl for baking, as a serving bowl for fruit salads, or even as a table centerpiece filled with lemons or other fruit. It's a gorgeous piece and very versatile! When I'm making pancakes I always seem to make a huge mess when trying to pour the batter onto the griddle. 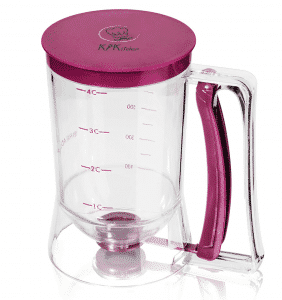 This batter dispenser does away with the mess and allows you to make evenly sized pancakes. From silver dollar pancakes to pancakes as big as your plate, this dispenser can do it all. It also allows you to easily measure the amount of batter being used so as to better track your Points, Calories, or other metrics! These stackable lunch containers allow you to easily transport food to and from work or school. 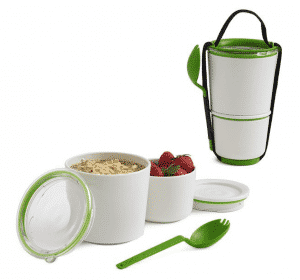 They are stackable, include an on board spork, and have a handy carrying strap to make transporting a snap. The individual containers are microwave safe making for a quick, hot lunch during the day. The stackable design provides easy portability while taking up less space. Steel cut oats have had a resurgence in recent years. Overnight oats are part of a healthy diet. They are good for you, filling, and they provide a ton of fiber. People had gotten away from making non-instant oatmeal because it took so long. 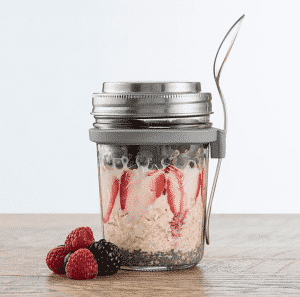 With the overnight oats idea, the time factor disappears. This handy container provides you with the container in which to make the oats, but also provides an onboard spoon for a grab and go breakfast! My biggest complaint with cooking is not being able to use all the fresh produce quickly enough. I'm always on the lookout for ways to keep fruits and vegetables fresh longer. 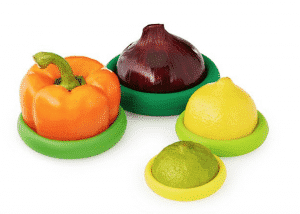 These food huggers definitely make a difference in the life of a cut piece of produce. I love this fruit bowl! It's frustrating when you have all this gorgeous fruit to eat yet some of it's not ripe enough to eat. Or, you have fruit that is ripe but you can't see it so it goes bad before you can eat it. This bowl allows you to have the ripe, ready to eat fruit easily visible on the tray, and the fruit that needs a bit more time in the vented glass bowl below. 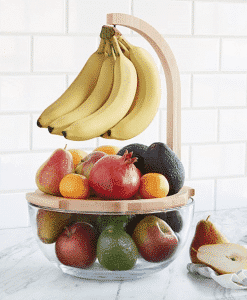 It also has a great hanging hook for bananas to ripen evenly! We have Taco Tuesday in my house quite frequently. Tacos are a great meal because everybody can customize them to their own tastes. Talk about win-win, a meal that the whole family can make work! 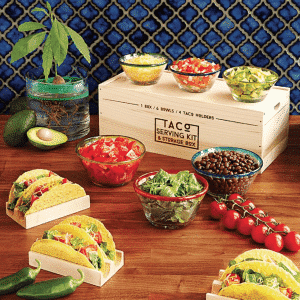 This set provides all the necessary tools all in one place – bowls just the right size for all toppings, taco holders so you don't lose any of the delicious filling, and a box to store it all in when you're finished! What better way to have Taco Tuesday than to grow your own ingredients? 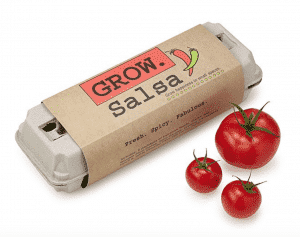 This Salsa Grow Kit has all the elements for a great Taco night – seeds for tomatoes, jalapeños, verde tomatillos, cilantro, and scallions all contained in an eco-friendly egg carton in which to start them growing. Once spring comes you'll be ready to transfer your plants to larger containers where they can produce delicious salsa ingredients! This water bottle shows you exactly how much water you're drinking throughout the day, when it's time to take another sip, and when it's time to head for a refill. 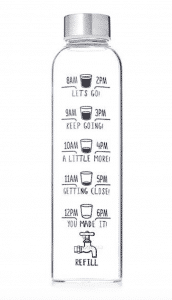 I always need reminders to drink more water and this water bottle definitely fits the bill (and makes it a little more fun)! Avocados are expensive and go bad very quickly once cut. You shouldn't have to throw away part of an avocado every time you use one just because your recipe calls for half of an avocado. 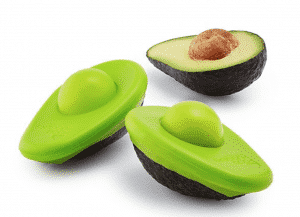 These Avocado huggers allow you to either keep the seed in place, or push the pocket in once you remove the pit to get a tight seal. Knowing that I can keep half an avocado fresh easily makes me want to cook with them more since I know they now won't go to waste! Who doesn't love a bowl of freshly popped popcorn? 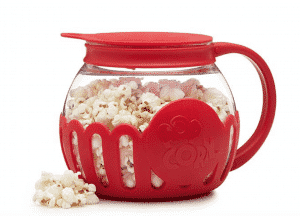 This microwave popper allows you to ‘dress' your popcorn any way you'd like. With this popper you are no longer at the mercy of the pre-bagged popcorn makers' flavors. You can top them with anything you'd like or just eat it plain! 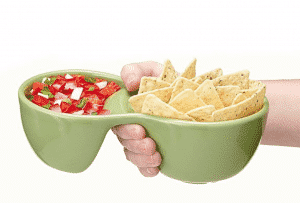 This bowl is the perfect size for a serving of tortilla chips and salsa all in one bowl. The spacing in between the two bowls allows you to keep a firm grip on the bowls. Gone are the days of trying to balance two separate bowls while enjoying a tasty snack! Love cooking with fresh herbs but don't have the space for a ‘traditional' garden? 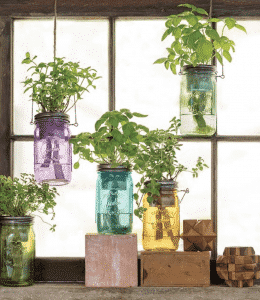 Enter Mason Jar Indoor Herb Gardens. These jars allow you to grow fresh herbs year-round. The jars regulate moisture and help bring the necessary nutrients up to the herbs' roots. Fresh herbs in the house year round? Yes please! 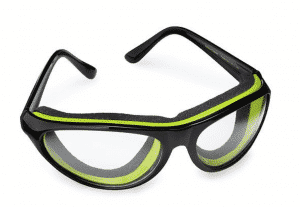 These goggles are definitely on my wish list this year. Every time I chop onions I look like I just lost my dog, first born, and best friend just based on the sheer volume of tears I shed. These googles help alleviate that problem (and will probably save me from dehydration). I love cooking with fresh herbs and greens but the stalks or stems can really be a pain. 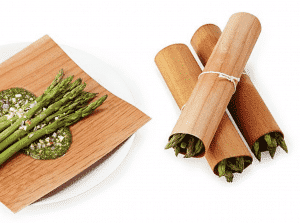 This device allows you to strip the stems of the parts you actually want to eat and include in your recipes. Nobody wants to take a bit of food, taste the wonderful flavors, and bite down on a bitter stem. This razor eliminates that problem! This infuser is multi-purpose. It provides a storage container for your olive oil. 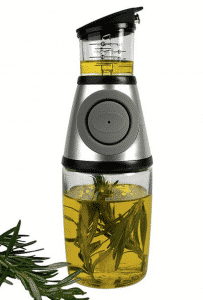 It also allows you to infuse your own olive oils with the herbs and spices of your choice. Finally it measures out exact amounts before pouring. Only need a teaspoon of olive oil? Pre-measure in the container before pouring. It saves you from spillage and on having to wash another measuring spoon. This Smart Garden grower allows you to grow basil and other fruits and herbs of your choice right on your kitchen counter year round! No more waiting for summer, planting your basil, remembering to water it, and forgetting it's there (out of sight, out of mind). 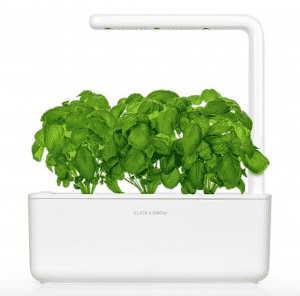 This all-in-one grower provides fresh basil (and other fruits and herbs) where you cook daily! Do you like experimenting with different levels of spice and heat in your recipes? 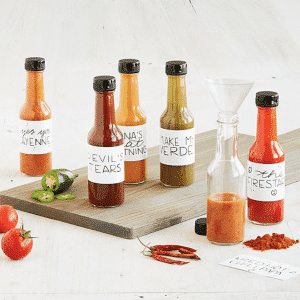 What better way to do that than with a Make Your Own Hot Sauce Kit? This kit provides cayenne, ancho, curry, and chili spice packs, as well as a variety of peppers, vinegars and brown sugar to concoct your own delicious hot sauces. Not sure what to make? The kit provides instructions if you don't quite know where to start. Display your own hot sauces at your next party or barbecue and bask in the oohs and ahhs from friends and family! There is nothing like freshly grilled vegetables. These grilling wraps take them to the next level, infusing them with the wonderful smokiness of Pacific cedar and alder. Just wrap your vegetables of choice in these flavor infusing wraps, pop them on the grill, and a few minutes later voila, freshly grilled vegetables infused with the smoky flavors of the Pacific Northwest. Don't you hate when you buy all this gorgeous produce only to find it wilted and brown just days later? 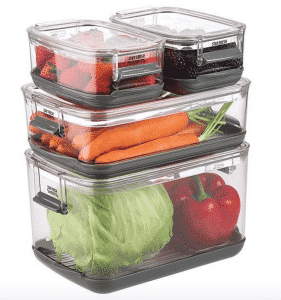 These storage containers help prolong the shelf life of all your fruits and vegetables. Each has a slotted bottom which acts as a colander to channel water away from the contents and keep everything fresh and crispy. If you don't like wasting food, these containers are a wonderful find! Don't you hate when you're pouring oil and you misjudge the angle of the bottle? You end up with entirely too much oil in your recipe, or on your salad, or spilling over the sides of your measuring spoons. This Adjustable Oil Pourer alleviates that problem with three different serving sizes to choose from. All you have to do is dial up how much you want and the Pourer does the rest. 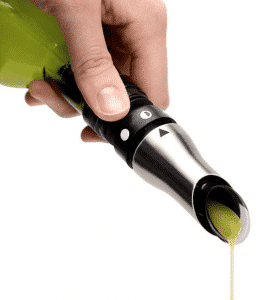 No more wasted Olive Oil, ruined recipes, or overly oily salads! 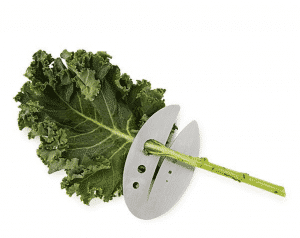 This Pizza Cutter is wonderful for cutting even slices in one pass. It allows you to rock back and forth a bit to make sure you make a clean cut every time. I find this cutter better than the round roller pizza cutters as it provides straight cuts allowing for more even pieces of pizza. No more arguing over who gets the biggest piece! Can you tell me if my order went through? If you placed an order for any of the products in the list you’ll have to check with the vendor directly.